Summary: Reading Josephus’ intriguing story about Alexander the Great. 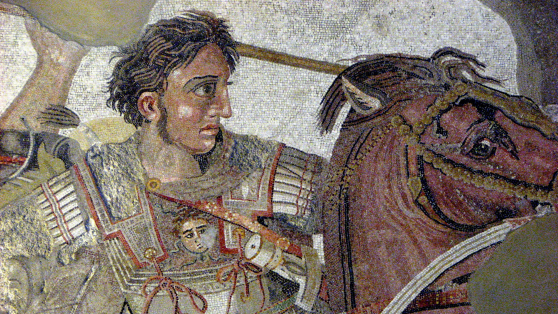 Note: This is the first article in a series on Alexander the Great. PURPOSE OF ARTICLE: To present an intriguing story from Josephus’ Antiquities regarding Alexander the Great, the Jewish priests, and a prophecy in the book of Daniel. Alexander the Great needs no introduction. He was the mighty king of Macedonia, a fierce warrior, a determined conqueror, and a legendary figure in history. Presiding over one of the greatest empires in ancient times, he revolutionized the world by introducing Greek culture and language to nations that he subjugated. He defeated the mighty Persian Empire at the Battle of Gaugamela, traveled to India, and sought to conquer the known world. But his life was cut short in Babylon at the young age of 32. Some believe that the Bible predicted Alexander’s rise (in Daniel 8) long before Alexander existed. As usual, critics and scholars have stepped up and protested that this is impossible – that Daniel 8 was written long after Alexander lived, thus constituting a “prophecy after the fact”. If you follow our articles, you know that there are many possible responses to these critics. But today, I want you to read a story from Book 11, Chapter 8 of the Antiquities of the Jews, penned by the famous Jewish historian Josephus. The entire story has been reprinted here (translation by William Whiston)1. Read it for yourself and decide if it’s true or not. So when Alexander besieged Tyre, he sent an epistle to the Jewish high-priest, to send him some auxiliaries, and to supply his army with provisions; and that what presents he formerly sent to Darius, he would now send to him, and choose the friendship of the Macedonians, and that he should never repent of so doing. Now Alexander, when he had taken Gaza, made haste to go up to Jerusalem; and Jaddus the [Jewish] high-priest, when he heard that, was in an agony, and under terror, as not knowing how he should meet the Macedonians, since the king was displeased at his foregoing disobedience. He therefore ordained that the people should make supplications, and should join with him in offering sacrifice to God, whom he besought to protect that nation, and to deliver them from the perils that were coming upon them; whereupon God warned him in a dream, which came upon him after he had offered sacrifice, that he should take courage, and adorn the city, and open the gates; that the rest should appear in white garments, but that he and the priests should meet the king in the habits proper to their order, without the dread of any ill consequences, which the providence of God would prevent. Upon which, when he rose from his sleep, he greatly rejoiced, and declared to all the warning he had received from God. According to which dream he acted entirely, and so waited for the coming of the king. And when Jaddus understood that Alexander was not far from the city, he went out in procession, with the priests and the multitude of the citizens. The procession was venerable, and the manner of it different from that of other nations. It reached to a place called Sapha, which name, translated into Greek, signifies a prospect, for you have thence a prospect both of Jerusalem and of the temple. And when the Phoenicians and the Samarians that followed him thought they should have liberty to plunder the city, and torment the high-priest to death, which the king’s displeasure fairly promised them, the very reverse of it happened; for Alexander, when he saw the multitude at a distance, in white garments, while the priests stood clothed with fine linen, and the high-priest in purple and scarlet clothing, with his mitre on his head, having the golden plate whereon the name of God was engraved, he approached by himself, and adored that name, and first saluted the high-priest. The Jews also did all together, with one voice, salute Alexander, and encompass him about; whereupon the kings of Syria and the rest were surprised at what Alexander had done, and supposed him disordered in his mind. And when he had said this to Parmenion, and had given the high-priest his right hand, the priests ran along by him, and he came into the city. And when he went up into the temple, he offered sacrifice to God, according to the high-priest’s direction, and magnificently treated both the high-priest and the priests. And when the Book of Daniel was showed him wherein Daniel declared that one of the Greeks should destroy the empire of the Persians, he supposed that himself was the person intended. And as he was then glad, he dismissed the multitude for the present. But the next day he called them to him, and bid them ask what favors they pleased of him; whereupon the high-priest desired that they might enjoy the laws of their forefathers, and might pay no tribute on the seventh year. He granted all they desired. And when they asked him that he would permit the Jews in Babylon and Media to enjoy their own laws also, he willingly promised to do hereafter what they desired. You be the judge. Is this story true, or did Josephus include a myth in his historical record? Should you agree with critics who insist that Daniel was written well after Alexander came to Jerusalem, thus making this story false? Or, is it possible that Alexander the Great really met with the Jewish high priest and read about himself in the book of Daniel? And if so, would that not prove that one of the Bible’s prophecies is, in fact, legitimate? Let that be something to ponder this week. Probably not true…josephus was a jew, so wouldn’t he be biased? Guess we’ll find out next week. Oh it’s definitely true. Classical Historians don’t include myths in their midst as to risk their reputation as a credible source. Plus there’s more than just Josephus out there to confirm Alexander’s Judean excursion. See what Arrian and Strabo have to say. You might find more to compare than to contrast.